If you’re looking for good healthy treats for your rats or mice, you might want to consider Pet Pasta by Onesta Organics. Onesta creates pet treats with your pet’s health in mind. Their Pet Pasta is made with certified organic human-grade whole foods such as fresh banana, carrot, and whole sprouted flax. What you won’t find in their treats are chemicals, colors, by-products, GMOs, or sweeteners. It is available in three varieties and looks similar to a very large thin whole grain cracker that is scored so it can be broken into strips. The Onesta Cinnamon Pet Pasta. I started with the cinnamon treat, broke the strips into small snack-sized pieces, passed them out to the crowd of anxious faces, and stepped back to watch. The first thing I noticed was that the small flat shape was very easy for the rats and mice to hold, it could also be eaten very quickly so nobody was forced to share. The rats wasted no time in devouring their treats and started searching the cage for crumbs, but the mice were only semi-interested. A few came out of their nests and sniffed the treat but most of them completely ignored it. I might have been offended if I didn’t know that this was completely normal for mice—they are a picky bunch—and something has to be pretty extraordinary for them to leave their comfy nest in the middle of the day. I expected the mice to eat them at some point but many of them were untouched the next day. 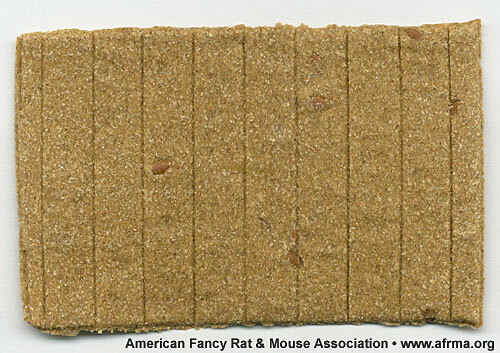 So, the cinnamon was a big hit with the rats, but the mice were a tough crowd . . .
A few days later I tried the carrot treats. Once again the rats were lined up at the cage doors and were already looking for crumbs before I had finished handing them out. The mice were, once again, only moderately interested. A few came out and ate the treat but most just stayed in bed. The biggest difference was that all of the treats were gone by the next morning. Okay, that was a little better . . . big hit with the rats, moderate hit with the mice. By the time I got to the banana treats I knew what to expect. The rats were lined up at the door trying to be the first to get their treat. The mice were, of course, sleeping. I dropped the pieces in the mouse cages and moved on to the rats (who were all pretending that they hadn’t had food in days). The rats inhaled theirs (duh!) but when I looked over at the mice I was stunned . 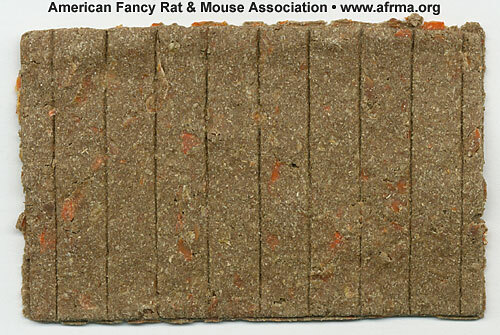 . . every single mouse was out of their nest eating their treat! They weren’t just running around looking for a place to hide it, they weren’t sitting in corners nibbling on it; they were in the middle of their cages eating it. That was much better . . . big hit with the rats, MEGA hit with the mice. You might expect a high quality treat like Pet Pasta to be a bit more expensive, but I was surprised to find that at $6 for a 1.76 ounce package, it’s right in line with the per ounce price of the chemical-laden sugar-filled “crispy treats” you find at most pet stores. 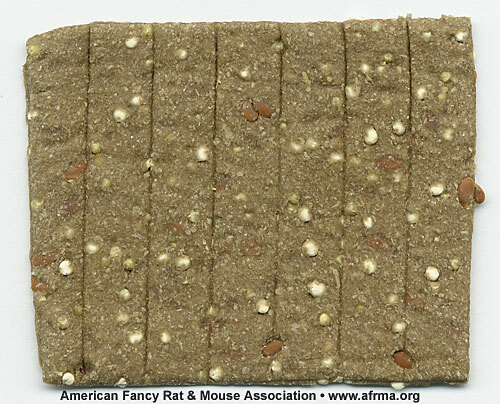 While it’s probably not something you would purchase regularly if you have a large number of animals, for those who only have a few rats or mice, this is a wonderful healthy treat that allows you to spoil your pet AND do something good for them at the same time. I originally got a box of the pet pasta at a rat event I went to a year ago. When I ran out, I contacted Onesta direct to get more. My boys loved the banana. It is a hard crunchy wafer made with organic ingredients, no junk. To keep it fresh, keep it in the fridge. With my current 3 new rattie darlings (1 girl and 2 boys), however, they do not like this product. Individual tastes I guess. Ed. Note: Pet Pasta treats are gently processed, handcrafted, dehydrated, USDA certified organic, and made with 100% human- grade, organic whole-food ingredients. Onesta never uses inferior ingredients, GMOs, or artificial chemicals in their products. They come in break-apart wafers so you can give a piece at a time. The Pet Pasta is sold in packs of 6 in a 50g/1.76oz box for $6 or 3 boxes for $16.50–$17. They also have a sample pack of one box of each flavor for $16.50. Available from their web site. The Onesta Banana Pet Pasta. The Pet Pasta Banana is made of whole kamut flour, banana, sprouted grains (quinoa, millet) and seeds (flax), algae (kelp, spirulina), grasses (alfalfa, barley), hemp protein, and cinnamon (all of these ingredients are human-grade quality and certified organic), calcium carbonate (human-grade quality supplement), and natural citric acid (human-grade quality and non-GMO). The Onesta Carrot Pet Pasta. The Pet Pasta Carrot is made of whole grain flours (durum wheat, kamut, spelt), carrots, sprouted flax seeds, hemp protein, grasses (alfalfa, barley, wheat grass), algae (kelp, spirulina), and cinnamon (all these ingredients are human-grade quality and certified organic), and calcium carbonate (human-grade quality supplement), and natural citric acid (human-grade quality and non-GMO). The Pet Pasta Cinnamon is made of whole durum flour, kelp, alfalfa grass, flax seeds, and cinnamon (all these ingredients are human-grade quality and certified organic), calcium carbonate (human-grade quality supplement), and natural citric acid (human-grade quality and non-GMO). NOTE: The Pet Pasta is made by Onesta Organics™, Inc., 1425 Russ Boulevard T107F, San Diego, CA 92101, (619) 295-1136. Their web site is http://onestaorganics.com/pet_pasta.php.